Wheel Building - Go anywhere. Bring anything. Few activities place a greater demand on the performance of a bicycle than cargo hauling and touring. Your wheels are the heart and soul of your bike, your license to drive, your passport to cross borders. Why treat them as an afterthought? 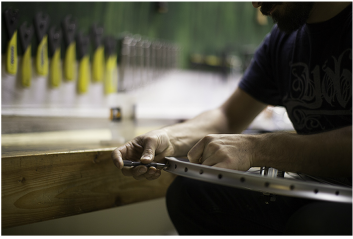 Green Machine Cycles provides expert wheel building as well as maintenance services and consulting. Whether you plan to deliver refrigerators on your bike, ride from here to Alaska, or punish your bike through a Chicago winter, the right components and the best assembly are your ticket to cycling satisfaction. We are happy to offer advice and education so you can make the most informed wheel buying decisions. For new wheels built from scratch, we offer a one year guarantee on wheels built at our shop, which includes any and all repair or component damage not caused by collision or impact, so long as you accept our recommendations on component choices. In other words, we guarantee your wheels will not need to be trued. Please contact us for more information on this generous guarantee of services.